As reported by USA Today, AEROSMITH vocalist Steven Tyler will launch his Out On A Limb Summer tour on July 2nd in Las Vegas, NV. A year after launching a solo country career, the AEROSMITH frontman is hitting the road this summer with a new band (the Nashville-based LOVING MARY) and a different approach to playing live. On his 19-city Out On A Limb tour, the rock icon is trading arenas for more intimate concert venues, where he'll rework AEROSMITH classics and tell stories behind some of the band's most beloved hits. The idea stems from an acoustic performance he did last fall as part of PBS' Front And Center series, with an emphasis squarely on the fans. "What would I not pay to go see (Paul) McCartney, but instead of playing with whoever he's with now, actually do (a show) where he tells you what he was thinking when he wrote "Yesterday"?" says Tyler, 68. "That's what I'm doing. I figured I'd talk about "Sweet Emotion" and "Dream On" and where I was when I wrote it, and "Seasons Of Wither" and how I played it." 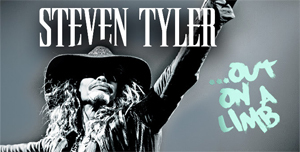 Tickets for Steven Tyler's Out On A Limb tour go on sale May 14th via livenation.com.